With Vico Painting, you’ll be pleasantly surprised. You can be assured that we will always deliver superior service that is on time and within budget. Our company excels thanks to a strong culture based on respect. Respect for our employees. Respect for our customers. Respect for our community. We are painting experts. Thus, we take personal pride in all of our work. We believe there is always room to improve how we perform, communicate with our customers, and build relationships. We strive to be the best knowing nobody is perfect. Our Company is available to take your call from 8 AM until 5 PM EST. We put you through to a person at our office or in the field. If you would like an estimate, we will schedule an appointment when you call. And not only do we set our own appointments, we keep them. A Job Site Supervisor is assigned to oversee your entire painting project from start to finish. A Job Site Foreman will always be onsite to keep you informed on the status of the project, answer your questions and address your concerns. 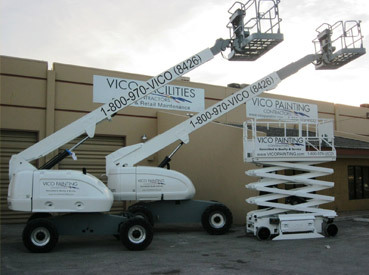 Vico Painting offers you a professional and mindful service that is second to none. Our competitive costs are designed to give you the best service for your money. We use only the finest products and expert painters. We offer experience with a wide range of products and services to best suit your needs. We cover the spectrum of all commercial and industrial painting. For the highest quality job at the best possible price, there’s only one choice. Vico Painting. Daily clean up and removal or lockup of dangerous tools and chemicals from the premises. Crews trained to use products and equipment safely. Carry comprehensive Worker’s Compensation, Bond Insurance, and Liability Insurance. Vico Painting cares about the longevity of our paint jobs and your finish product. To show our confidence in our methods and materials and the expectation that they will last for many years to come. we offer excellent warranties. 5, 7 or 10 year warranties are available which cover labor and materials directly from a manufacturer’s representative. We want your paint job to last as long as possible. The longer your structure looks good, the longer we look good! Here are a few recommendations for making your paint project last as long as possible.